On July 7, 1943, a U. S. Navy SNJ-4 Texan trainer aircraft , (Bu. No. 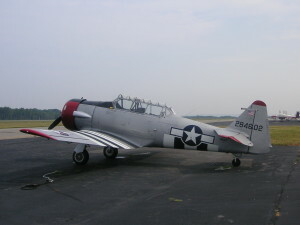 27614), was landing at the Brunswick Naval Air Station in a strong 90-degree cross-wind. As the pilot attempted to use alternate brakes to prevent a ground loop the aircraft nosed over. The pilot and instructor aboard suffered non-life-threatening injuries. 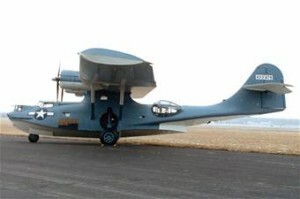 The aircraft required a major overhaul. U. S. Navy accident report #44-7567, dated July 7, 1943. 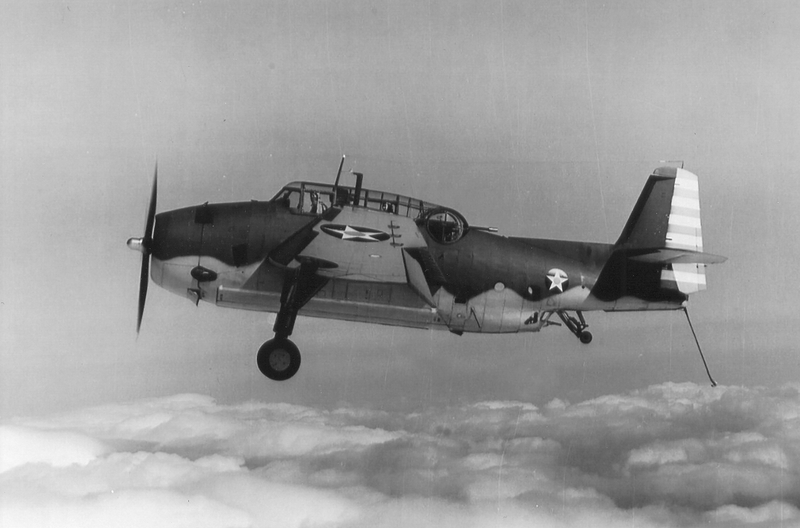 On May 16, 1944, a TBM-1C, (Bu. No. 17085), made a normal landing on Runway 14 at the Sanford Maine Navy Auxiliary Air Field. As the aircraft was rolling down the runway the left landing gear collapsed. The aircraft skidded to a stop and the three-man crew was not hurt. Source: U. S. Navy accident report #44-14211, dated May 16, 1944. 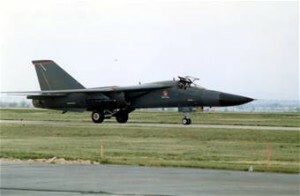 On the night of October 6, 1980, two U.S. Air Force FB-111A fighter jets, each with a crew of two aboard, left Plattsburgh Air Force Base in upstate New York for a routine training mission over Maine and the Atlantic Ocean. One aircraft was flying about twelve minutes ahead of the other. At 10:12 p.m., while both aircraft were over the ocean about 18 miles off the coast of Jonesport, Maine, the second FB-111 suddenly disappeared from radar. A search and rescue mission was instituted for the missing jet. About 3 1/2 hours later, a Coast Guard vessel recovered a helmet and seat cushion floating in the water, but there were no signs of the crew. Some small partial debris of the aircraft were recovered later also floating on the surface. The search for the missing crew was called off two days later. The pilot, Major Thomas M. Mullen, 35. Major Mullen died just 11 days short of his 36th birthday. The Navigator, Captain Gary A. Davis, 32. Both men were assigned to the 380th Bomb Wing at Plattsburgh AFB. The FB-111 was a strategic bomber, and it was initially reported that the aircraft involved in this accident was unarmed, but it was later reported that it was carrying a “training missile” which was equipped with an explosive warhead. On September 4, 1981, the missile was recovered by navy divers. On the morning of November 14, 1967, two U.S. Air Force F-101 fighter jets took off from Otis Air Force Base in Falmouth, Massachusetts, bound for Loring Air Force Base in Maine, and from there, on to Goosebay, Labrador. Both aircraft were assigned to the 6oth Fighter Interceptor Squadron at Otis. This was to be a long distance training flight. All was uneventful with the flight until the aircraft encountered snowy weather over Maine which reduced visibility. As the jets were passing over the town of Kingfield they were involved in a mid-air collision. One jet, (Ser. No. 57-376), suffered severe damage and the crew was forced to eject. The pilot, Captain Dean H. Glazier, 32, parachuted safely onto a farm about a quarter-mile west of West Kingfield Road. The radar officer, Major Lawrence Uchmanowicz, 38, landed in a tree about three-quarters of a mile from Captain Glazer. He was assisted by hunters who’d seem him come down. Both men were transported to the Dow Air Force Base hospital for treatment. Meanwhile, their F-101 had continued on and crashed into the side of Mt. Abraham, five hundred feet from the top. Wreckage was strewn over a large area. The crash site is located about six miles from Kingfield. The other F-101, (Ser. No. 57-378), was able to make it safely to Dow AFB on its own despite a large hole in the wing. The pilot, 1st Lt. James Craig, and the radar officer, Captain Vincent Robben, were not injured. 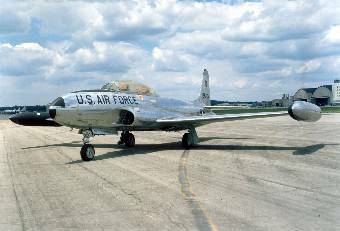 On November 5, 1966, Captain Edward S. Mansfield, 29, of the Massachusetts Air National Guard, was piloting an F-84 Thunderjet, (Ser. No. 51-9466), over the New Hampshire-Maine state line when the aircraft developed engine trouble and he was forced to bail out at 10,000 feet. Capt. Mansfield landed safely in the village of Kezar Falls, which is located in the southern portion of the town of Porter, Maine. Once on the ground he made his way to a nearby farm house. The F-84 came down in a nearby wooded area, and nobody on the ground was injured. It was reported that this was the second time Capt. Mansfield had been saved by a parachute. He was forced to bail out of another F-84 in Spain in 1962. 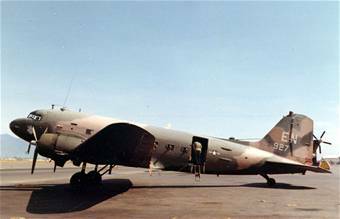 On December 11, 1965, a U.S. Navy P2V Neptune patrol plane with a crew of six aboard was flying about 25 miles off the coast of Maine when an unspecified in-flight emergency occurred. A navy spokesman later told reporters that the pilot barely had time to radio a distress call before the aircraft went down in the frigid water. Search and rescue aircraft and boats were immediately dispatched to the area and recovered all six men, however, the co-pilot, Lt. (Jg.) Donald S. Lavigne, 26, of Albany, N.Y., had succumbed to exposure before he could be rescued. 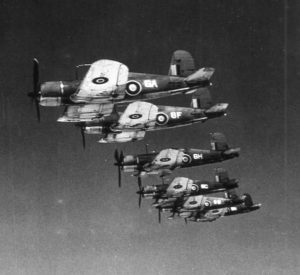 The five survivors were all transported to the Brunswick Maine Naval Air Station and were reported to be in good condition. Pilot: Lt. Robert C. Muller of Lombard, Ill.
Aviation Tec 1/c Emanuel A. Croasmun, 33, of Cleveland, Ohio. Aviation Machinist Mate 2/c Paul L. Force, 28, of Paterson, N.J.
Aviation Machinist Mate 3/c Pasquale Pape, 21, of Rome, N.Y. Ordinance Man 1/c Larry R. Clark, 23, of Brunswick, Maine. On January 24, 1963, an Air Force B-52 Stratofortress bomber, (Ser, No. 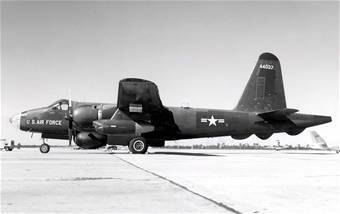 53-0406), left Westover Air Force Base in Chicopee, Massachusetts, for what was to be a low-altitude training flight over northern Maine to practice techniques in evading enemy radar. Shortly before 3:00 p.m. the aircraft encountered turbulence during which the aircraft’s rear stabilizer suffered a structural failure which sent the plane into the side of Elephant Mountain in Piscataquis County. Of the nine men aboard, two survived. Crew Commander: Lieutenant Colonel Dante E. Bulli, (40), Survived. Lieutenant Colonel Joseph R. Simpson, Jr., (42). He’s buried in Barrancas National Cemetery in Pensacola, Florida. He was a veteran of WWII and Korea. Major Robert J. Morrison, (36). He’s buried in Maple grove Cemetery in Dodge City, Kansas. He was a veteran of WWII and Korea. To see a photo of him, see www.findagrave.com. Major Robert J. Hill, Jr., (37). He’s buried in Osborne Memorial Cemetery in Joplin, Missouri. To see a photo of him go to www.findagrave.com. Major William Walter Gabriel, (45). He’s buried in Golden Gate National Cemetery in San Bruno, California. Major Herbert L. Hanson, (42). He’s buried in Black Hills National Cemetery in Sturgis, South Dakota. Captain Charles Gerson Leuchter, (32). He’s buried in Golden Gate National Cemetery in San Bruno, California. Captain Gerald J. Adler – Survived. Technical Sergeant Michael Francis O’Keefe, (26). He’s buried in Long Island National Cemetery in East Farmingdale, New York. The crash site where this accident occurred has been preserved and is regularly visited by hikers. Photos of the site can be found elsewhere on the Internet. Springfield Union, “B-52 Missing In Maine; 9 Men Aboard”, January 25, 1963, page 1. Springfield Union, “2 rescued, 2 dead, 5 Still Missing On B52 Lost In Maine”, January 26, 1963, page 1. On November 3, 1959, two Air Force jets, at T-33 trainer, (51-4499), and a Delta F-102 fighter, (56-1497), were taking part in a radar training mission over western Maine in which the T-33 was to act as an enemy aircraft, and the F-102 was responsible for intercepting it via radar. 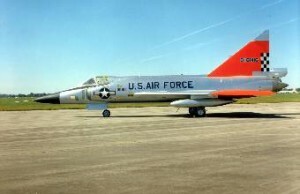 At some point near Flagstaff Lake, the F-102 made a mock attack run at the T-33, during which a mid-air collision between the two jets occurred. The F-102 sliced the tail off the T-33 sending it into a downward plunge. The pilot of the T-33, 2nd Lt. Frederick M. Johnson, 22, managed to eject safely from 30,000 feet. He dropped to 14,000 feet before deploying his parachute, and came down in a tree. Because of near total darkness, he had no idea how high the tree was, so he remained there for the night before climbing down at first light and hiking to a logging camp. 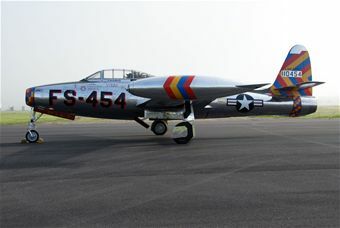 The second man aboard the T-33, was 1st Lt. Alfred Williams, 26, of Manchester, Connecticut. He also ejected safely, but became entangled in his parachute lines and was killed when he landed head-first on the north side of Bigelow Mountain at the 1,500 foot level. The partially opened parachute of the F-102 pilot, 1st Lt. Gary N. Sugar, 24, of Seattle, Washington, was located about fifteen miles from where Lt. Williams was discovered, but his body has never been found. On February 27, 1979, a 54-year-old man from Stratton, Maine, was on an ice fishing trip at Flagstaff Lake when he noticed what appeared to be aircraft landing gear protruding from the muck of the lakebed. The water level was unusually low at the time which explains why the discovery hadn’t been made earlier. 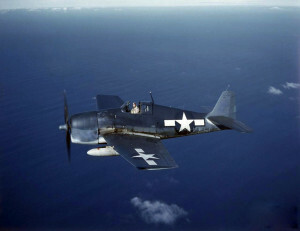 Navy divers were sent to investigate to see if the aircraft was still intact and if it contained the body of Lt. Sugar. The F-102 was armed with six Falcon missiles, and 24 rockets. The Hour, (Norwalk, CT.) “Plane Wreckage Found Near Lake Believed To Be From 1959 Crash”, February 27, 1979, Pg. 26. On June 27, 1960, a U.S. Air Force KC-97 Tanker was refueling a B-47 bomber when an explosion occurred. The tanker crashed on Jonathan Smith Mountain and all aboard were killed. (Pilot) 1st Lt. William F. Burgess, 26, of Indian Lake, N.Y.
(C0-pilot) 1st Lt. Lewis F. Turner, 25, of Spokane, Washington. (Navigator) 2nd Lt. Raymond S. Kisonas, 26, of Waterbury, Connecticut. (Flight Engineer) Master Sgt. Harold E. Young, 40, of Selma, Alabama. (Boom Operator) T/Sgt. Robert P. Costello, 30, of Greenfield, Ill. Some parachutes were reportedly seen. The plane was based at the Plattsburgh AFB in New York, and was assigned to the 380th Bombardment Squadron. On November 16, 1937, a BT-9A (36-122) military plane from Boston crashed at Lewiston Air Port. On April 28, 1944, Ensign Kenneth C. McKay, age 22, was killed while piloting an F6F-3 Hellcat, (Bu. No. 42238), on a gunnery training flight over Rockland, Maine. The crash occurred about 300 yards north of the Naval Auxiliary Air Field. On May 4, 1944, Ensign William Donald Larson was piloting an F6F-3 Hellcat, (Bu. No. 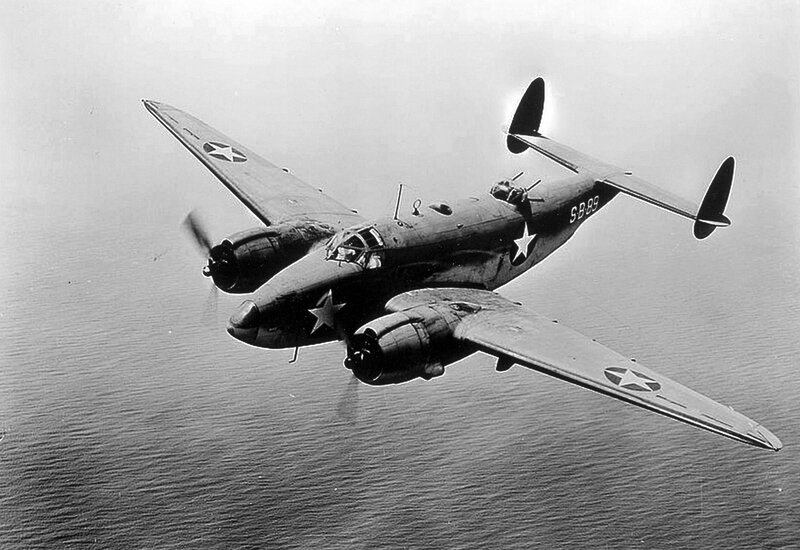 41489), on a glide-bombing training flight off the coast of Cape Porpoise, Maine. While flying in the #2 position in a column following the flight leader, Ensign Larson entered into his first dive-run from an altitude of 6,000 feet. While making his dive, he was killed when his aircraft plunged into the water an disappeared. Approximately twenty minutes later an oil slick and some pieces of flotsam were seen on the surface of the water in the area where his plane went in. Ensign Larson was assigned to VF-44. To see a picture of Ensign Larson, go to www.findagrave.com, memorial #75446469. 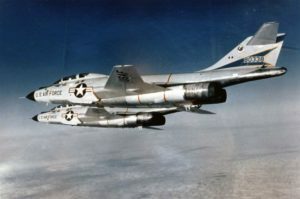 On April 10, 1961, two F-101B Voodoo fighter jets took off from Dow Air Force Base in Bangor, Maine, on an intercept mission to identify an unknown aircraft which had appeared on radar. After completing the intercept, both aircraft set a course back to Dow. By this time it was after midnight, and the jets flew in a driving rain with zero visibility. At about 1:00 a.m., one of the F-101’s, (#57-0401), crashed into the top of Kench Mountain, a hill just south of Bald Mountain, in the town of Dedham. Both the pilot and radar observer were killed. 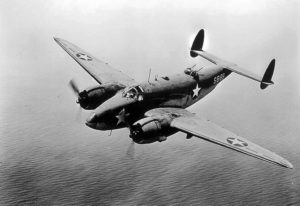 (Pilot) Captain Vernal W. Johnson, 27, of Bangor, Maine. He was survived by his wife Deanna and two sons. He’s buried in Rose Hills Memorial Park in Whittier, California. (Radar Observer) 1st Lt. Edward C. Masaitis, Jr., 27, of Brewer, Maine. He was survived by his wife Barbra Ann, and his son and daughter. He’s buried in St. Teresa Cemetery in Summit, New Jersey. Both men were assigned to the 75th Fighter Interceptor Squadron at Dow AFB. Maine Aviation Historical Society, Dirigo Flyer, “Kench Mountain F-101B Crash Hike”, Vol. IV, No. 7, July, 1996. On September 20, 1955, a U.S. Air Force KD-97 tanker-refueling aircraft crash landed and burst into flames at Dow Air Force Base in Bangor, Maine. Five of the twelve crewmen aboard were injured, but none critically. All escaped the burning aircraft, the smoke from which was seen for miles. Two base firemen were also injured fighting the blaze, but not seriously. The aircraft was assigned to the 341st Air refueling Squadron, part of the 4060th Air Refueling Wing stationed at Dow. Source: Lewiston Daily Sun, “Aerial Tanker Crashes, burns At Dow Base”, September 21, 1955. On Friday, September 9, 1960, six U.S. Air Force F-100 Super Sabres, all belonging to the famous Air Force Thunderbirds aerobatic flight team, left Pease Air Force Base in Newington, New Hampshire, for Dow AFB in Bangor, Maine, to take part in the Downeast Air Fair being held that weekend. When the jets arrived they made two passes in formation around the field before peeling off to land one at a time. As one of the F-100s came down on the runway, its landing gear suddenly collapsed. The aircraft skidded on its belly across the runway, then across a taxi way, before coming to rest in a ditch. There was no fire, and the pilot was not hurt. On May 26, 1949, an Air Force F-84B Thunderjet, (#45-59537), was returning to Dow Air Force Base in Bangor, Maine, due to an onboard fire. The plane crash landed in a wooded area next to the field, smashing its way through 100 feet of brush and small trees before erupting in flame. The pilot managed to escape unharmed. The pilot was identified by the press as being 2nd Lt. Albert H. Bull, 22, of Verbank, New York, assigned to the 49th Fighter Squadron at Dow AFB. At approximately 2:45 p.m., Lt. Hawes contacted Dow tower and requested a homer bearing. He was advised to switch to “F” channel for further instructions. At 3:00 p.m., he was given a heading of 273 degrees. Eight minutes later he asked the tower for a recheck as he was still uncertain of his position, and advised he was beginning to run low on fuel. Successive headings were given at three to five minute intervals. At 3:20 p.m., Lt. Hawes reported his altitude to be 26,000 feet with 60 gallons of fuel remaining, and asked Dow tower how far he was from the base. Dow tower replied that by their estimate he was fifty miles out. At 3:36 p.m. Lt. Hawes advised that he was still unable to orient himself to his location. At that time he was given a course correction to 276 degrees. Lt. Hawes also contacted Dow tower and asked for instructions, and was advised to attempt to make it back to Dow AFB, which is about 40 miles distant from Deblois. Another captain piloting a P-84 in the area contacted Hawes and advised him to attempt to land at Deblois, but Lt. Hawes elected to head for Dow AFB instead. At 3:58 p.m., while still about 19 miles east of Dow AFB, Lt. Hawes reported he was now out of fuel and was going down. Instead of bailing out, he elected to remain with the aircraft and aimed towards a small open field amidst hilly and wooded terrain. With no engine with which to guide the aircraft, he crashed about one mile short of the field and was killed. The crash was witnessed by the P-84 pilot who had advised Lt. Hawes to attempt an emergency landing at Deblois airstrip. The “P” in the P-84 aircraft designation stood for “pursuit”. The designation was later changed to “F” as in F-84, which stands for “fighter”. The P-84 and the F-84, were essentially the same aircraft. At the time of this accident Lt. Hawes was assigned to the 14th Fighter Group, 49th Fighter Squadron, then based at Dow AFB in Bangor, Maine. This was the first fatal accident for the 49th FS since its activation on December 21, 1946. Lt. Hawes is buried at the U.S. Military Academy Cemetery at West Point. Report Of Special Investigation Of Aircraft Accident Involving P-84B, No. 45-59580. The Hangman’s News, (The Official Publication Of The 49th Fighter Squadron Association), “From Props To Jets Part 4 – 1 Apr. 1948 To 30 June 1948”, by Paul Scoskie, September 2008, Vol. 6, Issue 3. On the morning of February 2, 1943, a Civil Air Patrol airplane with two men aboard took off from Trenton, Maine, for a routine patrol flight off the Maine coast. Shortly after 9:00 a.m. the aircraft developed engine trouble and the pilot was forced to ditch in the sea about 45 miles off Brunswick. The pilot, 1st Lt. William B. Hites, 30, of Jamestown, New York, and the flight officer/observer, 1st Lt. Welles L. Bishop, 34, of Meriden, Connecticut, were able to escape from the plane before it sank. Another aircraft radioed their position to a shore control station, but rough seas made rescue operations difficult. Although both men wore life-vests and waterproof coveralls, they perished before help could reach them. Both men were survived by their wives. In 1970, twenty-seven years after the crash, Lt. Welles L. Bishop was posthumously honored by the town of Meridian and the Connecticut Civil Air Patrol during ceremonies marking the 29th anniversary of the establishment of the national Civil Air Patrol, (Dec. 1, 1941). The Morning Record, “Meridian Pilot Lost In War To Be Honored”, November 13, 1970. On the morning of July 25, 1924, a storm over Lakehurst, New Jersey, broke a navy observation balloon free of its mooring at the Lakehurst Naval Air Station setting it adrift on its own without a crew. The balloon was carried on an easterly course across Connecticut, Rhode Island, and Massachusetts. By the afternoon it was sighted near Isle au Haut off the Maine coast with 1,500 feet of cable still hanging beneath it. By this time the balloon was beginning to settle, and was even brought lower to the water when the cable began to drag across the waves. By the time the Wandank reached the scene the balloon was badly damaged and torn, however the basket and instruments was still in good condition. In all, the runaway balloon had traveled 450 miles on its own. On the morning of May 16, 1949, a flight of four U.S. Air Force F-84 jets was scheduled to take off from Dow Air Force Base in Bangor, for a routine training mission. Shortly before take off, the pilot of one aircraft advised the flight leader that the tail pipe temperature gauge on his F-84 wasn’t working. He was advised to change aircraft, and while he was doing so, the other three F-84’s took off. 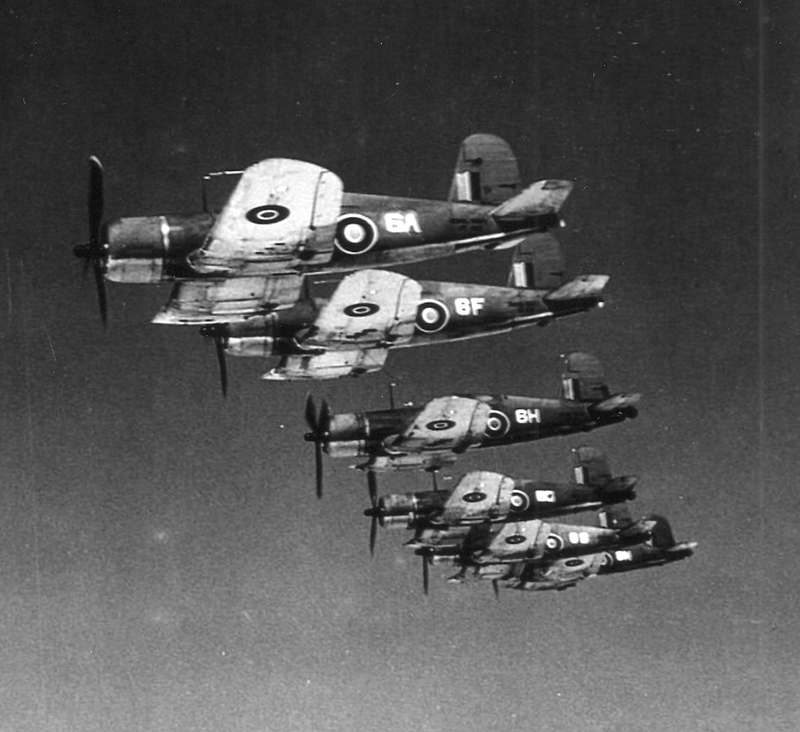 The pilot moved into the number four position of the three ship formation, however he never radioed the flight leader, and the flight leader didn’t ask for identification. What followed next was a case of follow the leader, and after the flight went through a series of aerobatic maneuvers, it was noticed that the fourth plane was no longer with them. The missing aircraft wasn’t immediately reported as the flight leader assumed the fourth plane had run out of fuel and returned to base. In reality, the missing F-84 had crashed and exploded in the town of Charleston. The other three F-84’s returned to base without incident. Exactly what occurred to the fourth plane is unclear. The last thing the pilot remembered was beginning a series of rolls, and then waking up on the ground with a civilian doctor administering to his injuries which had evidently been obtained when he bailed out of the aircraft. Investigators discovered that the entire left wing, the right wing outboard panel, empennage, and canopy, were not at the crash site. These were later found in a heavily wooded swampy area, indicating they may have broken free while the aircraft was in flight or while it was falling. 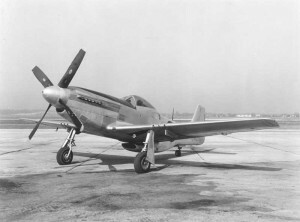 On the afternoon of May 17, 1949, an F-51D Aircraft, (#45-1164A), piloted by a USAF 1st Lieutenant took off from Grenier Air Force Base for a routine training flight. While at 20,000 feet, his aircraft began to experience engine problems by backfiring and cutting out. Checking his instruments, all appeared to be reading normal, but the problem persisted, so he declared an emergency and began heading for Portland Airport which was the closest to his position. Just before turning for his final approach, engine coolant suddenly spewed all over his windshield cutting visibility and causing a further loss of power to the engine. When he landed on the runway he discovered that the aircraft wasn’t going top stop before reaching the end, so he retracted the landing gear and allowed the P-51 to skid to a stop on its belly. Although the aircraft was damaged, the pilot was unhurt. 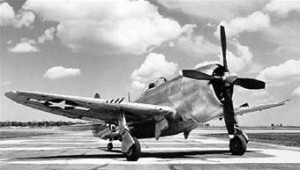 F-51 was the air force designation given to the P-51 used by the Army Air Force during WWII. On June 13, 1947, 1st Lt. James B. Clouse was piloting a P-47 Thunderbolt, (#44-89427) from New York to Dow Field in Bangor when the aircraft’s canopy became covered with oil and dust obscuring his vision. To further complicate matters, the aircraft’s radio had ceased working. He reached Dow Field just before 9:00 p.m., and circled in an attempt to establish radio contact, but was unsuccessful. Those in the control tower realized something was wrong, and turned on the lights of runway 22. The night was dark and there was no moon, further hindering the pilot’s vision. As Lt. Clouse came in to land he realized he’d over shot the runway and went around for a second try. On his second approach the landing gear struck soft ground at the end of the runway and broke free. The aircraft’s momentum carried it down the runway on its belly causing major damage to the plane. Fortunately Lt. Clouse escaped without injury. On August 7, 1954, a flight of four F-84F aircraft took off from Dow Air Force Base in Bangor, for an instrument practice, and aerial refueling, training mission. The flight took off at 8:28 a.m. and climbed to 20,000 feet, where the pilots practiced formation flying for about 25 minutes before beginning instrument flight practice. It was at this time that the pilot of the number 2 aircraft reported to the flight leader, 1st Lt. Richard C. Hafenrichter, that he was unable to get fuel flow from his pylon tanks. Lt. Hafenrichter directed to the flight to rendezvous with the air-tanker at 10,000 feet for refueling. As the number 2 aircraft was refueling, Lt. Hafenrichter positioned himself off the tanker’s right wing to observe the operation. As he slowed his aircraft to match the tanker’s speed he noticed a vibration in his aircraft, (#51-1464A). The vibration would cease as he increased his throttle, but then come back when he reduced power. At this time he turned command of the flight over to another pilot and turned his F-84 towards Dow AFB. As he approached Dow at 10,000 feet, he began a wide circle around the base in preparation of making a flame out landing on runway 33, but as he eased back the throttle the vibration returned, and then began to increase. He tried to reduce the vibration by increasing the throttle, but discovered that this no longer worked. The F-84 then began to shake violently and the engine RPM suddenly dropped to zero. Lt. Hafenrichter ejected safely, and the aircraft crashed and burned in a wooded area of Bucksport, about 8.5 miles from the base. On Sunday, May 24, 1942, a U.S. Army C-40D aircraft, (Ser. No. 42-22249) crashed 5 miles east of Howe Brook, Maine while on a transport mission from Bolling Field in Washington, D.C., to Montreal, Canada, to Presque Isle, Maine. The plane dove in at a steep angle, (Estimated by investigators to be 75 degrees.) with such force that debris was thrown up to 1,000 feet ahead of the impact. Due to the total destruction of the aircraft, investigators were unable to determine the cause of the accident, but noted that weather “was undoubtedly a strong causal factor”. At 6:00 a.m. on the morning of October 4, 1989, a U.S. Air Force KC-135 strato-tanker based at Loring Air Force Base in Limestone, Maine, was returning to base after a six hour refueling operation over Canada when the aircraft suddenly exploded in a massive fireball. Debris was scattered over a wide area, but the main portion of the plane came down about two miles northwest of Perth-Andover, just to the east of the U.S./Canadian Boarder. All four crewmen aboard were killed. (Pilot) Lt. Col. Wiliam H. Northcutt, 42, of Oklahoma City, Oklahoma. (Co-Pilot) 1st Lt. Robert D. Weinman, 27, of Milwaukee, Wisconsin. (Navigator) 2nd Lt. Albert H. Taft, 25, of Urbana, New York. (Boom Operator) Airman 1st Class Jack D. Cupp, 24, of Athens, Tenn. The reason for the explosion is unknown. On November 25, 1958, a U. S. Air Force KC-135 stratojet tanker crashed and burned on approach to Loring Air Force Base. Two crewmen, Captain Herman J. Dosenbach, and T/Sgt. 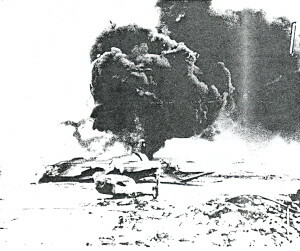 Charles A. Holsclaw, managed to escape the flaming wreck with non-life threatening injuries. The other five members of the crew perished. (Pilot) Captain John P. Eifolla, 41. (C0-pilot) Major John B. Brown, 39, of San Benito, Texas. Captain Bernard Morgan, 40, of Hope, Kansas. He was survived by his wife Maxine and four children. 1st Lt. Donald R. Gladdings, 29, of Shreveport, La. He was survived by his wife Patricia, and a daughter. (Boom Operator) T/Sgt. Ronald L. Champion, 26. He was survived by his wife Joan, and a son. The KC-135 happened to crash 100 yards from the wreck of a B-47 bomber that had crashed three days earlier on November 22. The men guarding the wreck dove for cover as the plane approached. 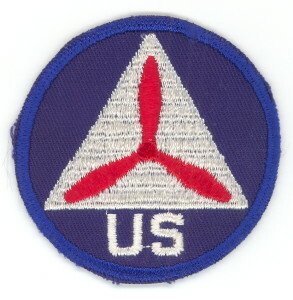 All four men aboard the B-47 had been killed in the crash. 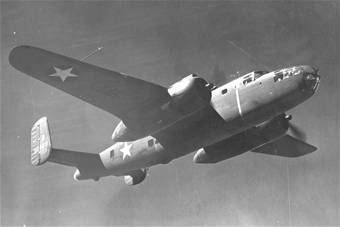 At 1:45 p.m., on August 30, 1941, a U.S. Army O-52 observation plane (Ser. No. 40-2705), was making a landing at Portland Airport, on the north-south runway. Just as the plane was about to touch down, a civilian plane crossed its path from the east-west runway and a collision between the two occurred. The O-52 was wrecked, but the pilot and his passenger escaped with minor injuries. The two civilians aboard the other aircraft were uninjured. The O-52 was assigned to the 152nd Observation Squadron. Source: U.S. Army Air Corps Technical Report Of Aircraft Accident dated September 18, 1941. According to the Army Air Corps investigation report on this accident, the aircraft involved crashed about ten miles south of Springfield, Maine. Other sources put the location closer to Lee, Maine. At 4:45 p.m., on November 15, 1941, two Douglas B-18A bomber aircraft, left Westover Field in Chicopee, Massachusetts, bound for Bangor Air Base in Maine. The two planes were not cleared as one flight, but as two individual flights. 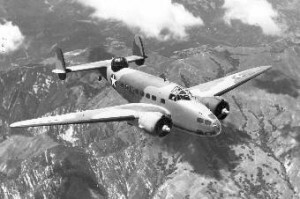 The first B-18, (Ser. No. 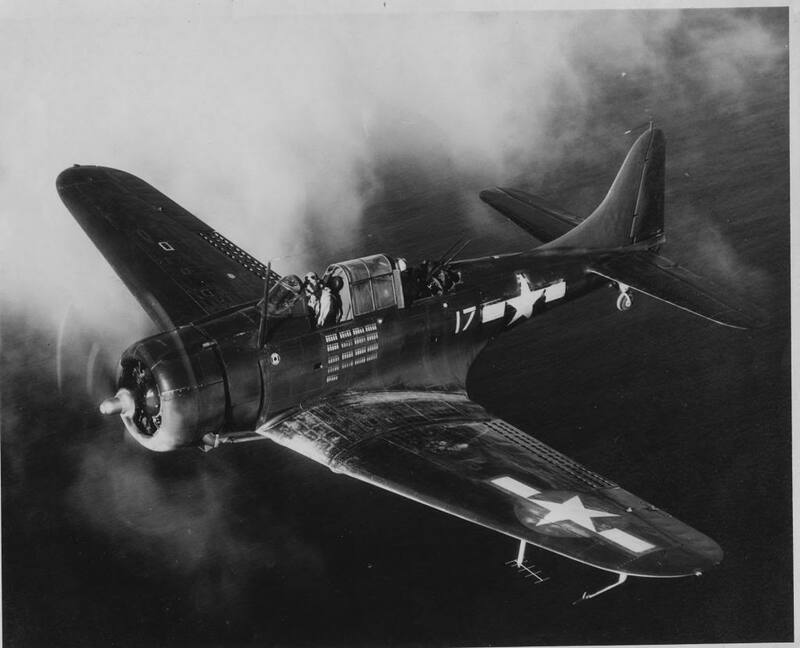 37-521) was piloted by 2nd Lt. Peyton W. Beckham, and the other by a pilot identified only as Lt. Offers. The two men had agreed to stay in sight of each other during the trip, and had further agreed that in the event they had to fly above any overcast in the vicinity of Bangor that that Lt. Beckham would wait until Lt. Offers landed first. This was due to the weather forecast for Bangor stating there was cloud cover over the area. At a point about half way between Concord and Augusta, both aircraft climbed to 5,500 feet to get above the 3,500 foot overcast. When they reached Bangor shortly after 6:00 p.m., Lt. Offers made his descent first as per their agreement. The overcast ceiling at Bangor at this time was 1,400 feet, and dropping, and darkness was coming on. At 6:32 p.m., after some garbled radio dialogue with the Bangor control tower due to interference with the radio signals from a Canadian source, Lt. Beckham advised he would try to make it to Portland, Maine, as his aircraft wasn’t equipped for instrument flying. By 6:46 the overcast had dropped to 400 feet. At about 7:20 p.m. Lt. Beckham’s aircraft was seen approaching Springfield, Maine. Ten minutes later it passed over the Carry Farm about ten miles south of Springfield, where three hunters later said it passed over their camp at a very low altitude heading southwest, and shortly afterwards they heard it crash. According to the hunters, the weather in the area was very bad, with poor visibility due to fog and rain. The plane had crashed in a remote and thickly wooded area surrounded by bog and swampland. Investigators concluded that the left wing caught in the tree tops near the bottom of a hill, dragging the aircraft down and causing it to swing to the left for 10 to 15 yards before it began to cartwheel up the hill for 200 yards. It was at this point the plane broke apart and caught fire. Debris was scattered in all directions for 200 to 300 yards. (Co-Pilot) 2nd Lt. Wyman O. Thompson, 21. He’s buried in Underwood Cemetery in Underwood, North Dakota. To see photo of Lt. Thompson, and one of his gravesite, go to www.findagrave.com, and see Memorial #21814620. (Engineer) Corporal Jacob L. Parson, 30. He’s buried in Rosemont Cemetery in Rogersville, Penn. (Radioman) Pfc. Lee E. Rothermel, 20. He’s buried in Trinity Lutheran cemetery in Valley View, Penn. One of the cockpit instruments that was recovered at the scene was the plane’s airspeed indicator, which was stuck at 195. The men were assigned to the 63rd Bomb Squadron, 43rd Bomb Group. This crash is said to be the first fatal military aviation accident to occur in the State of Maine. To see photos of the crash site as it appears today, see www.mewreckchasers.com. Twenty-two days after this accident, the United States was drawn into World War II. On December 30, 1941, an A-29 bomber aircraft, (Ser. No. 41-23302) crashed and burned on take off from Bangor Air Base. The seven man crew escaped, but the pilot and copilot were injured. At 10:30 a.m., on December 19, 1941, a Boeing B-17A (Y1B-17A) (Ser. No. 37-369) crashed and burned on take off from Bangor Air Base. All nine crewmen aboard escaped, however three were seriously injured. Only first initials were used to identify the crew in the accident investigation report with the exception of the pilot and engineer. This New England military aircraft accident is some-what historically significant due to the fact that the aircraft was one-of-a-kind. The fuel system for this aircraft had been changed (Upgraded) the previous day by a Master Sergeant who’d been sent to Bangor specifically to do the job. The reason for such an unusual measure was because this B-17 was a testing prototype fitted with superchargers on the engines, and the Army Air Corps, had much time, money, and resources devoted to this project. At the time of this crash, the Air Corps was in the process of developing a modern four-engine, high-altitude bomber. 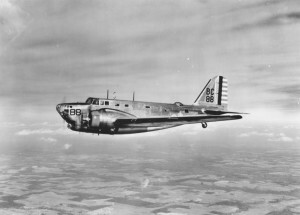 This B-17 (37-369) was the fourteenth produced by Boeing, but the only one designated an “A” variant, and the first to be equipped with turbo-superchargers, which were considered necessary for the aircraft to operate at higher altitudes with greater speed. The accident investigation committee tasked with finding the cause of the accident made the following two conclusions which are transcribed here. 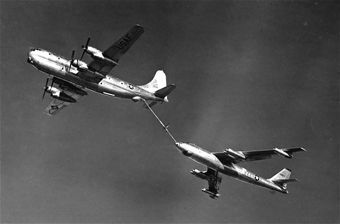 B-47 Stratojet during refueling operations. 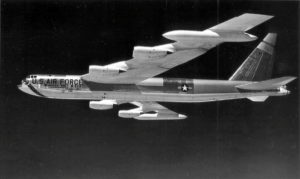 On February 26, 1965, a flight of three B-47 bomber aircraft, and one KC-135 tanker plane, were en-route from Torrejon Air Force Base in Madrid, Spain, to Pease Air Force Base in Portsmouth, New Hampshire. The planes were returning to the U.S. after a three week deployment overseas. 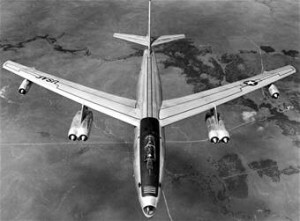 The B-47s were assigned to the 100th Bomb Group assigned at Pease, and the tanker was part of the 71st Air Refueling Squadron at Dow Air Force Base, but all were under the command of the 8th Air Force. As the formation was about 800 miles from the coast of Maine, the tanker began refueling operations. After refueling one of the B-47s, a second moved into place. At 9:40 a.m. Eastern Standard Time, a mid-air collision took place between the tanker and the second B-47 resulting in a massive fire ball. Both aircraft went down in flames and into the icy water. No parachutes were seen by crew of the other aircraft, and even though the planes carried life jackets and rubber rafts, Air Force officials doubted any survivors could last long in the frigid water and cold temperatures. Between both planes, eight servicemen were lost. (Pilot) Capt. James B. Redding, 27, of Webster, N.Y.
(Co-pilot) Capt. Milton S. Stone, 32, Normal, Ill.
(Navigator) Capt. Frank Valasquez, 31, of Brooklyn, N.Y.
(Instructor Pilot) Major Charles E. Michigan, 34, of Medford, Mass. (Pilot) Capt. Leland W. Payn, 32, of Lampassas, Texas. (Co-pilot) Capt. Robert G. Lowe, 29, of Arlington, VA.
(Navigator) Lt. Milburn D. Taylor, 22, of Carbondale, Ill.
Mstr. Sgt. Carey A. Addison Jr., 32, of Louisiana. Little information is available about this accident as press reports were vague. On February 13, 1943, a two-man Navy plane crashed into Blue Hills Bay while on a training flight. The type of plane was not identified. The pilot, Lieutenant John Shelley, of Wellesley, Massachusetts, was rescued by townsmen from Surrey, who braved the icy waters in a small boat to get to the downed airman. An unidentified radioman was lost in the crash. Lt. Shelley stated that both he and the radioman had managed to climb onto a wing of the partially submerged aircraft and the radioman attempted to swim the mile or so to shore. The water was cold, with floating ice and strong currents. On the morning of June 26, 1949, a Maine National Guard C-47A, (Ser. No. 4292076), took off from Dow Air Force Base in Bangor, Maine, to transport 22 members of the of the 195th Army Band (Maine National Guard) to Portland, Maine, for an authorized drill. Besides the members of the band, the plane carried a pilot and co-pilot, for a total complement of 24 men. Upon reaching Portland Airport, the pilot attempted to land on runway 10 and over shot it. After touching down, the pilot attempted to control the aircraft, but due to its weight and momentum found it impossible to do so. At the time it touched down, the plane was loaded with 3,700 pounds of fuel, 4,800 pounds of passenger weight, and an estimated 500 pounds of band equipment, bringing the total of 9,000 pounds over and above the static weight of the aircraft. The plane left the end of the runway and crossed 100 feet of open ground before plunging into the Fore River. Despite the large amount of fuel aboard, there was no fire, and the aircraft didn’t flood or sink. However, the plane was a complete loss, and all 24 men aboard were transported to area hospitals with varying degrees of injury.